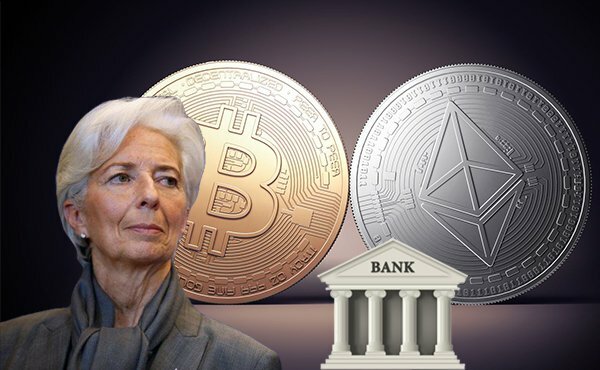 Earlier this week, Christine Lagarde, the head of the International Monetary Fund (IMF) stated that she believes bitcoin and cryptocurrencies will eventually replace banks and existing financial systems by eliminating the necessity for intermediaries and third party service providers. As Lagarde emphasized, the vast majority of cryptocurrencies such as bitcoin and Ethereum are still struggling to solve their underlying scalability issues. Previously, in an interview with major South Korean financial news publication JoongAng, Ethereum co-founder Vitalik Buterin stated that it could take two to five years for public blockchain networks to scale with two-layer and on-chain scalability solutions. But, once bitcoin scales to a capacity in which hundreds of transactions can be settled per second, Lagarde explained the decentralized nature of bitcoin could provide general consumers with a more efficient, robust, secure, and cost-efficient financial network as an alternative to the global banking infrastructure. Furthermore, Lagarde noted that the mainstream adoption of bitcoin and cryptocurrencies would result in the decrease of power of central banks and leading financial institutions. Fiat currencies would no longer be of any value as central banks and local financial authorities would not be able to manipulate the value of assets. “Today’s central banks typically affect asset prices through primary dealers, or big banks, to which they provide liquidity at fixed prices—so-called open-market operations. But if these banks were to become less relevant in the new financial world, and demand for central bank balances were to diminish, could monetary policy transmission remain as effective?,” added Lagarde. Already, through the Bitcoin Core development team’s scaling and transaction malleability solution Segregated Witness (SegWit), bitcoin has been able to scale to a certain extent by decreasing the size of transactions and blocks. Additionally, the demand toward bitcoin and the cryptocurrency market has increased to a point wherein multi-billion dollar financial institutions such as Goldman Sachs and Fidelity have started to address the rising popularity of cryptocurrencies by launching ventures including cryptocurrency trading operations and mining. In the upcoming years, through appropriate scaling solutions and the integration of two-layer scaling platforms, bitcoin will be able to position itself at the forefront of financial disruption; challenging banks and financial institutions to evolve into the global financial system.